Samsung made a big deal at the launch of the NX100 of the organic shape of a body that was reminiscent of ?a drop of morning dew hanging from a leaf?. 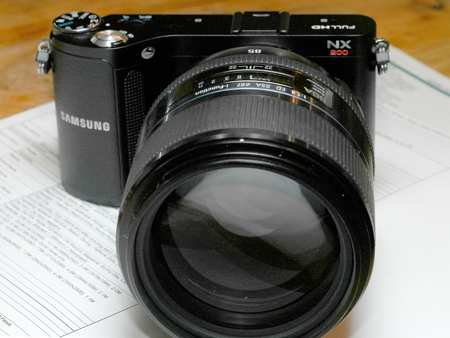 People outside Samsung most often commented on the fact that the NX100 was slightly larger than they expected. In truth, the curved top-plate design looks a little old fashioned rather than organic, but I never thought the camera too big. While the world seems intent on the miniaturisation of electronics products, cameras included, there is an optimal size for a camera that needs to be controlled. 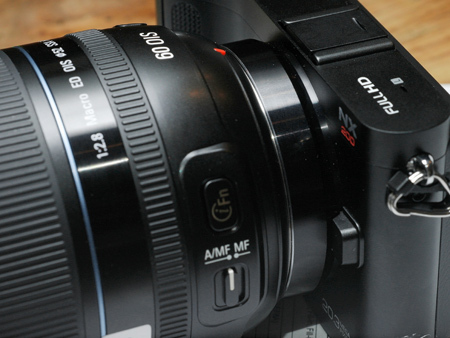 A point-and-shoot camera can be as small as you like, as you only ever need to access ?shoot? and ?play?, but when a body has the control functions of a DSLR, and interchangeable lenses of a certain size, it needs to have enough volume so that it can be gripped and balanced in the hand. 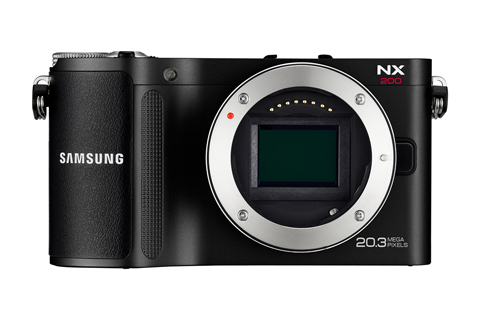 Samsung has listened to its critics, and the NX100 replacement, the NX200, is a good deal smaller than the original compact-style NX model. The company seems to have followed Sony?s lead and, while not quite as anorexically thin as the latest of the NEX series, it is headed in that direction. In fact, the body has slimmed to the point where the lens mount needs to protrude from the front face to ensure sufficient back-focus distance for the APS-C sensor covering lenses. The NX100 measures 120.5x71x34.5mm, while the new NX200 body is longer but thinner and shorter at 116.5×62.5×36.2mm. 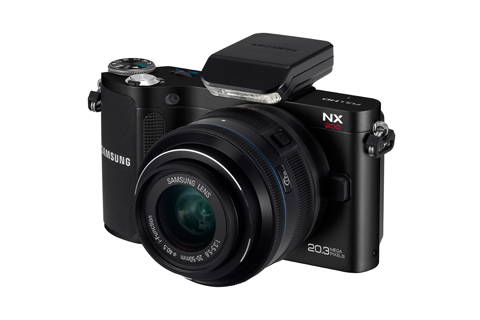 Samsung has broken its NX range into three categories; Classic, Style and Movie (we have yet to see a Movie body), and on first sight the NX200 falls clearly into the style section. On picking up the body I was immediately struck by its light weight, the solid build and a design reminiscent of the company?s previous NV series of compacts. The feel is very sleek, while the grip varies from the NX100 in its use of a textured front finger-ridge and the protruding rubberised thumb pad on the back. The camera will appear in kit form with either the 18-55mm zoom most often kitted with the Classic NX10/11 bodies, or the smaller 20-50mm, stubby, collapsible zoom that comes with the NX100. With either lens the camera feels very comfortable and well balanced ? 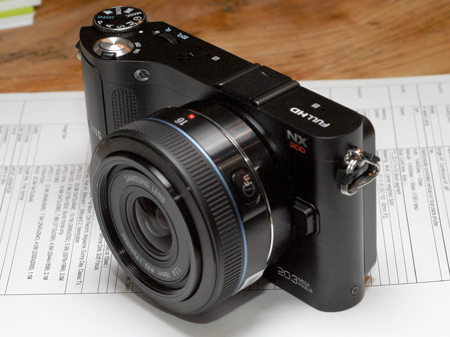 and, importantly, small enough to fit in the pocket of a summer jacket (the NX100 is more a winter-coat-pocket model). It really does seem the kind of camera you can carry discreetly in the hand almost anywhere. Fitted with the company?s new pancake 16mm f/2.4 lens, again the camera looks and feels very nice ? as it will also do with the 20mm and 30mm pancakes. The jump to 20 million pixels is really quite significant, and takes the NX200 to the number seven position in the highest pixel-count chart for non-medium-format bodies currently announced. In an APS-C sensor this will surely test Samsung?s noise-reduction techniques to the full, although the company is confident enough to increase its top sensitivity setting to ISO 12,800. Only a full test will really determine what the benefits are of this new sensor, but for now it is quite an impressive feat. 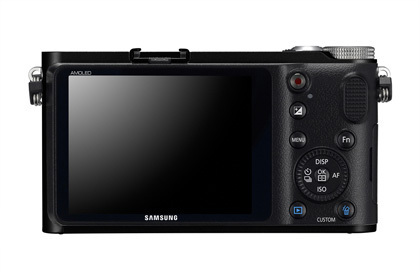 Samsung has used the NX200 to introduce the second version of its i-Function feature. 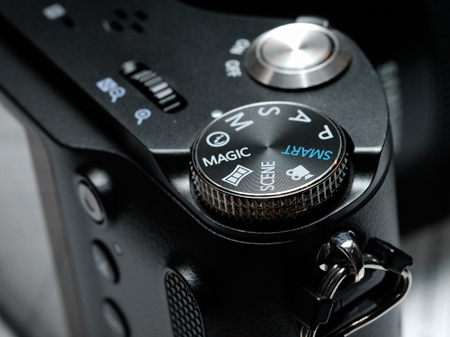 Pressing the button on the barrel of all the company?s lenses (except the 30mm pancake) opens the function menu on the LCD. It is now possible to customise which functions the i-Function button displays so you don?t have to wade through features that you never use. This makes the concept a little faster to use, but only a little ? it probably has more to do with reducing annoyance at seeing menu items you don?t want to see, but which could be passed by in a split second anyway. If you reduce the i-Function menu to just two items, though, it really does offer a quicker mode of operation. Other new features, such as lower noise and faster AF, are hard to verify at the moment, as the model I was using was not a full production sample, but even so I didn?t notice anything to obviously counter the company?s claims. In the same breath I was able to see that the camera can capture full-resolution JPEGs at a rate that sounded like 7fps, but how that will work in the real world with the AF on we?ll have to see. It is a little disappointing that Samsung has stuck with the same VGA rear screen that it used in its first NX body. It is bright enough and the AMOLED design certainly delivers a good viewing angle, but the resolution makes it awkward if you ever want to focus manually ? or check absolute focus in playback. While most people will perhaps not need to do either of these things, enthusiasts using lens-mount adapters and those buying the company?s new 60mm macro and wide-aperture 85mm lenses will almost certainly need to be able to scrutinise the display in more detail than it can provide. The 85mm, 60mm, 16-80mm and 18-200mm lenses launched with the NX200 have been a long time coming as we?ve known about them for 18 months or so. The timing is perhaps unfortunate for their launch at this point, as it is clear that Samsung really does not have a camera to complement them at the moment. The NX200 is a complete mis-match for their weight and bulk, as they are lenses of significant size. Having a wide maximum aperture, the 85mm particularly has a broad diameter and does not allow the camera to rest level on the table when placed down. 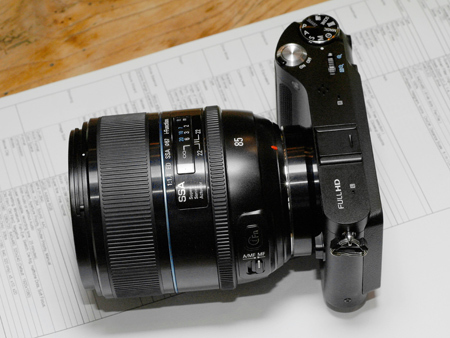 I tried these larger lenses on the NX11 body and they looked much more at home, but again the movie-quiet AF, especially of the 28-200mm, is rather wasted on a camera with a low-resolution movie mode, mono sound and no place for an external microphone. These appear to be quality units, and while their optical superiority will probably be detectable on the 14.6-million-pixel sensor of the NX11, they really cry out for the 20 million pixels housed in the NX200. They are not cheap, either, with the 18-200mm set to retail at £699 and the 60mm macro at £549. The price of the 85mm f/1.4 has not been announced yet, but you can be sure it will be more than the Samyang version. They all suggest a more serious body than the NX200 is required, especially one with an eye-level and high-resolution viewfinder. Perhaps we will just have to wait a bit longer for a Classic-shaped body with the new sensor ? or that Movie design model. It will be interesting to see how much the NX200 kits retail for when they finally hit the shops. On face value at least, the NX200 will replace a model that was selling for half its price, which it could be argued does not really qualify it as a replacement at all. The price points are so different (the suggested price for the NX200 kits is £699, while NX100 kits can be had for £300) that really the company might have been better to maintain the two running alongside each other to provide an entry and advanced option for the customer. Perhaps we?ll see a price drop once they go on sale.